MEAT EATERS HAVE NO IDEA HOW FAR AND WIDE THEIR CHOICES REACH TO DAMAGE THE LIVES OF THOSE THAT JUST WANT TO LIVE THEIR LIVES, RAISE THEIR CHILDREN AND BE LEFT ALONE. They are harassed to keep them from grazing on the grass that cows raised for food eat. So the buffalo are harassed and slaughtered to keep them from eating the grass that the ranchers want their cows who are raised for food to eat. Just so meat eaters can have their steak or hamburger. Pretty disgusting if you ask me! 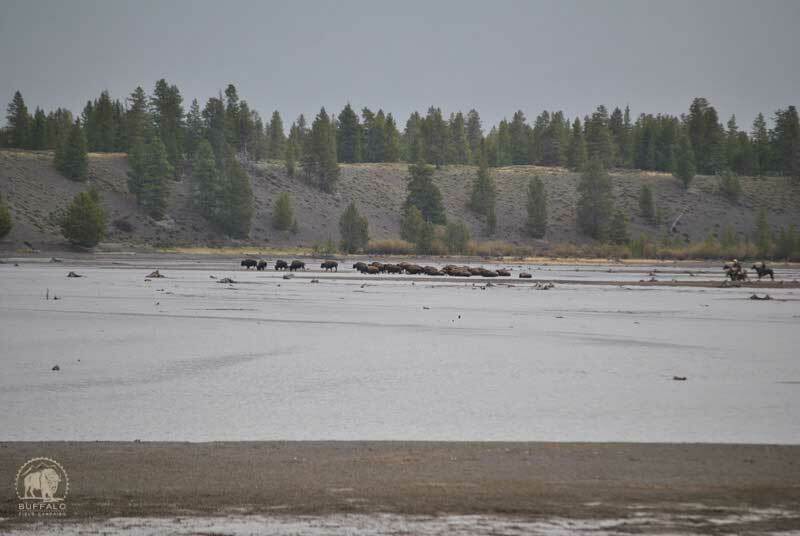 BFC (Buffalo Field Campaign) has witnessed two hazing operations in the past week, both targeting wild buffalo who migrated to the South Fork / Denny Creek area of the Hebgen Basin. This portion of the Basin south of the Madison River is currently a “no tolerance” zone for wild buffalo. Last Thursday, a total of forty-seven adults including pregnant females and juveniles, along with eight newborn calves (some born just yesterday) were pushed off of their chosen ground. 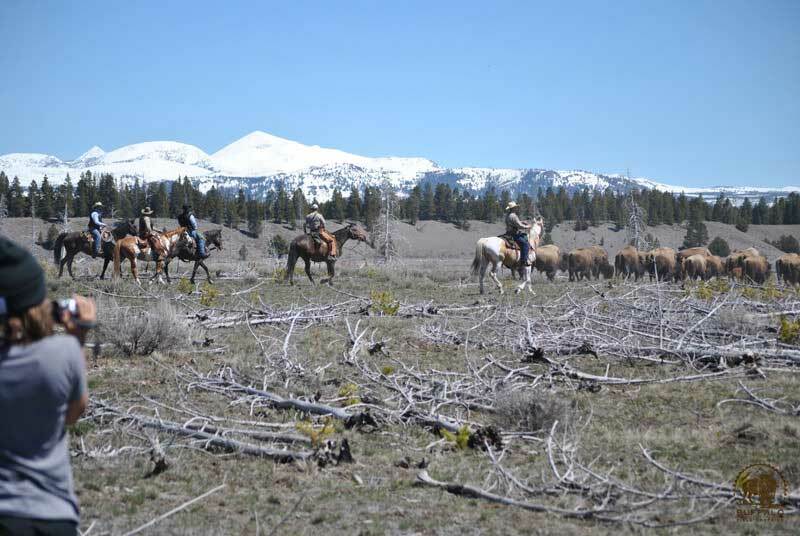 Six riders, three with the Montana Department of Livestock and three with Fish, Wildlife, and Parks, did the dirty work. They were assisted by two Gallatin County Sheriffs and our new game warden. The buffalo were not having any of it. They immediately took off from the riders at a dead run and got the attention of another group of nineteen buffalo (including two big bulls who we were concerned about getting shot) and while the 47 took off in one direction, the 19 took off in another, never to be seen again. The agents were left in the dust. The 47 kept running right down the Madison Arm Road along Gallatin National Forest. After a few miles, they ducked off deep into the woods. It seemed the hazing was over when the agents loaded up their horses, but a few miles down the Madison Arm Road, they pulled over and unloaded again. They eventually found the buffalo in the woods and proceeded to chase them along the road, down to the lake shore, back onto the road, and back down to the shore. From here they made them swim across and go up to the Northwest Bluffs of the Madison River, where they are allowed to be. It was a long, hot day for the buffalo and BFC patrols. The calves were exhausted, and hopefully, they are now resting. Afternoon patrols are keeping an eye on them. BFC was all over this hazing operation and didn’t miss a thing. Here are a few snapshots from the day. And there’s not a single domestic cow on the land they were hazed from, most of which is public land. All of this is paid for with your federal tax dollars. Buffalo again returned to the area later that afternoon but no actions were taken against them until the following Tuesday. It seems that the “serious threat” of brucellosis transmission that Montana livestock interests use to harass and kill wild buffalo is only a concern Tuesday through Thursday, and never after 5 pm, when it’s time to clock out and take a long weekend. Tuesday’s haze was conducted by the Department of Livestock, Fish, Wildlife & Parks, and the US Department of Agriculture’s Animal and Plant Health Inspection Service. 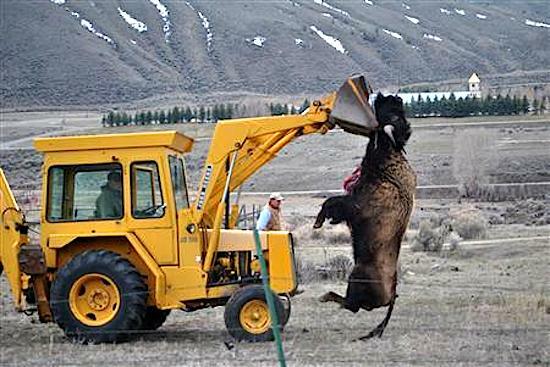 The hazers started bullying twenty-seven adult buffalo and six newborn calves and found a few more along the way, so it ended with a total of thirty-nine adults and juveniles and six newborn calves. Like last week, the hazers had another challenging time with it. The buffalo took off, again leaving them in the dust and heading straight for thick timber, where the agents lost them for at least an hour. While they searched, a huge thunderstorm rolled in, dropping heavy rain and hail, soaking the bullies. A while later, the cowpokes found them and pushed them through cattle-free public lands of Gallatin National Forest, over tons of fallen trees (very hard for the wee calves to navigate) to the Madison Arm Road, down to the Madison River, back up to the road, then back down to the river (sound familiar? ), forcing them across to the northwest bluffs where they finally left them alone. But the agents weren’t done. They headed over to Red Canyon, site of the only summer cattle ranch in the buffalo’s year-round habitat, where there currently are no cows. 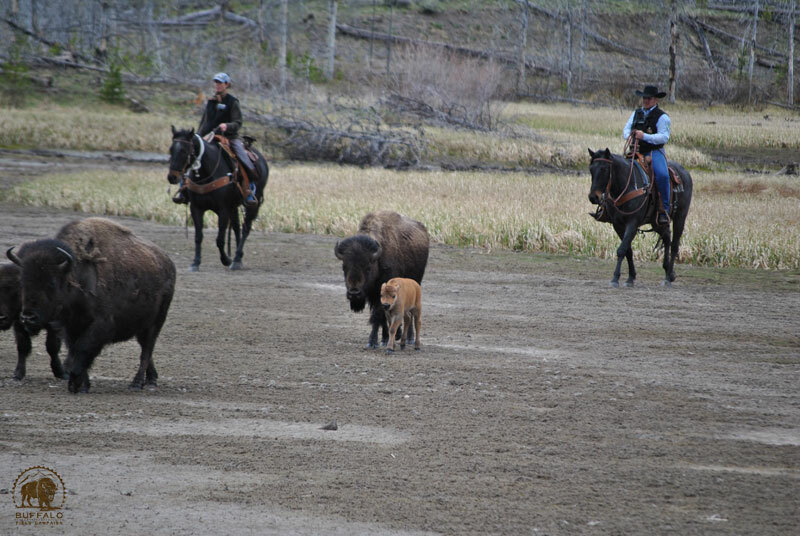 The agents attempted to haze a family of eight adult buffalo and one new calf. The agents found themselves on the wrong side of the fence from the buffalo so they couldn’t get to them. As they moseyed back to try to find their way around to the buffalo, one of the riders was bucked off his horse and the buffalo, having seen the riders, were already gone. The new MT Fish, Wildlife & Parks game warden drove out to the buffalo’s location and proceeded to fire off cracker rounds (explosives fired from a shotgun) to try to scare them further. The buffalo walked just a few more yards, over to land where they are allowed to be, but the cowpokes went after them anyway, on foot (a first! ), hootin’ and hollarin’, and firing cracker rounds. All but four buffalo swam across the water to the Narrows Peninsula of Horse Butte, and after that, the bullies finally left. TAKE ACTION! Help us end hazing (and slaughter). Call Montana Governor Steve Bullock and tell him to work with the legislature to repeal MCA 81-2-120, the law that puts authority over wild buffalo in Montana into the nefarious hands of the Montana Department of Livestock, and to endorse a plan that respects wild bison like wild elk in Montana. #406-444-3111 or governor@mt.gov. EXTINCTION? – Are wild buffalo going extinct? This was a piece done by George Wuerthner in January of this year but very relevant today and so incredibly heart wrenching. It reflects badly on the people of Montana that they tolerate this annual slaughter to go on. It also exhibits poor judgment on the part of hunters, tribal members, and others who participate or sanction this crime against nature and our national patrimony. 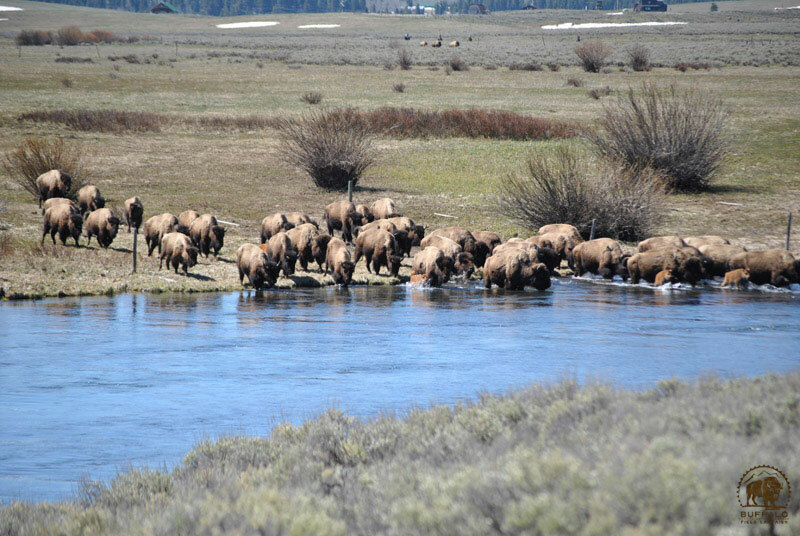 The park’s bison have gone through several genetic bottlenecks. At one time, the population numbered 25 animals. And previous years of slaughter and capture/shipment by the livestock industry and others outside of the park means the park’s bison have gone through repeated genetic reductions. Last year, for instance, 600 bisons were killed. This is made worse by the fact that bison are a tournament species, whereby dominant bulls do the majority of all breeding. This means the “effective” breeding population is much lower than the actual population numbers and, as a result so is the genetic diversity. More oxygen thieves. I will not be silenced for the voiceless ones. How sad!!! Stop this harassment of Buffalo now! There must be a way for them to coexist! …not as long as the monstrous cattle barons rule! These so called Cattle Baron,s are slowly buying their way to hell where their money and power won,t save them.